When you start discussing thin soles, you need to remember that sole thickness varies widely based on age, breed, hoof care history, diet – everything is relative! According to several vet friends, most “normal” horses have thin soles… 10mm is supposed to be average, but 6-8mm may be more “normal”. Normal for most horses is quite thin relative to a mustang on soft range! 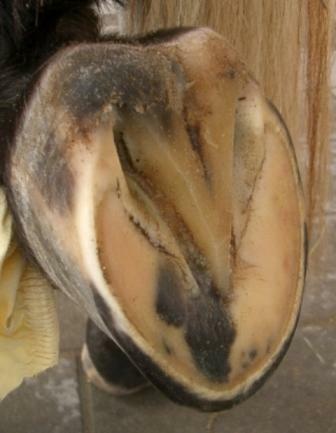 Thick soles like we see in some walking horses and mustangs are not normal for most breeds or horses, and exceptions even exist in the gaited horse breeds… sole thickness varies widely, period. I have been able to get a very thick sole to accumulate using Epona synthetic shoes, but it sheds back to “normal” once the horse is left barefoot. 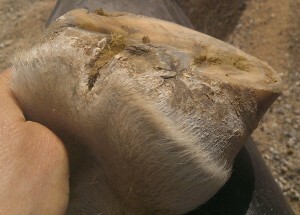 My friend Asa, in Las Vegas, hates thick sole because in her arid region, it needs to me trimmed out. 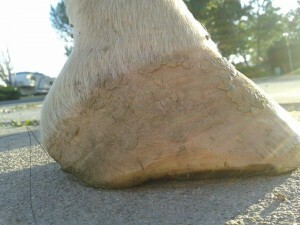 If a horse has a sole that isn’t worn or trimmed to be thin, and you leave a more stout wall &/or protect the sole from wear, then feed a better diet (see www.drkellon.com ! ) and use something like Keratex or Hoof Armor, you may be able to add 1 to 4 mm. Maybe! In a case where the sole is already a a relatively healthy depth, and the wall height is good, you may not be able to get much improvement. 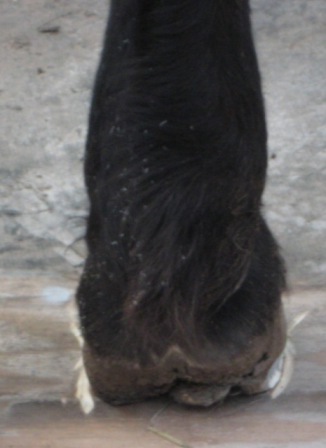 Again, what is normal for one breed or individual, like a typical Gaited horse or Morgan, would be very thick for a TB or some lines of QH. Sole depth varies. My Marcel, a never shod Arab, has TB type feet, a thinner sole that often needs more protection. 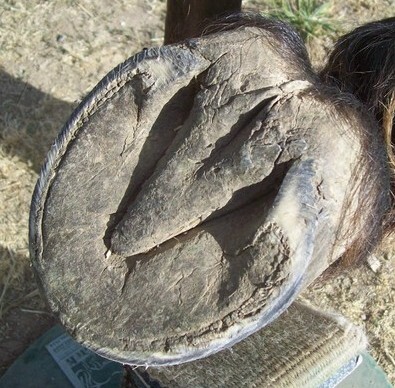 I only worry when the horse is uncomfortable in its living environment. I used Hoof Armor and glue-on Glove shells on Diana Thompsons Timothy, a 29 to 32YO TB with historically thin soles, typically 6mm, and the result was that after 3 years barefoot, he had 12 to 14mm of sole depth. So sometimes it can happen but it really depends on the individual case. 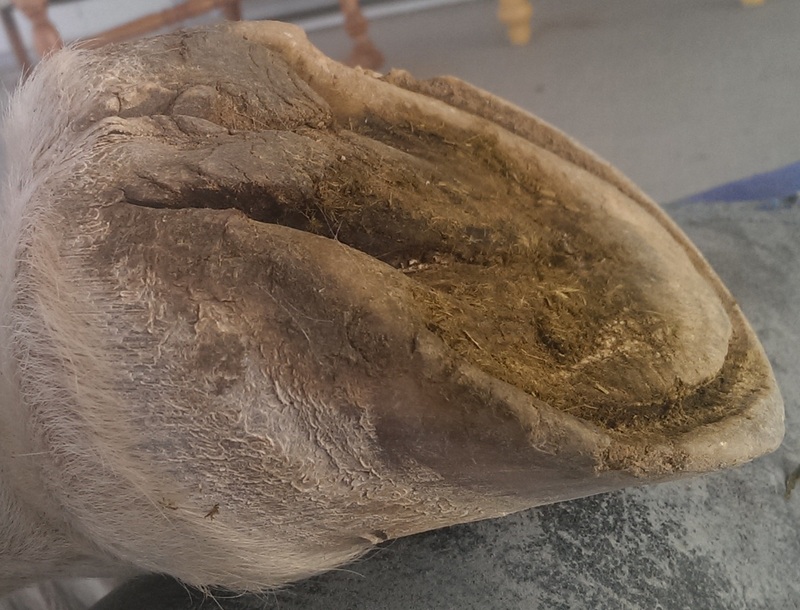 In Tim’s case, we changed his diet and used glue-on boots for 6 months to protect his soles, and when they came off I used the Hoof Armor. He was on a super abrasive surface, so his feet wore down fast and we’d put him back in glue-ons after 5 to 8 weeks. 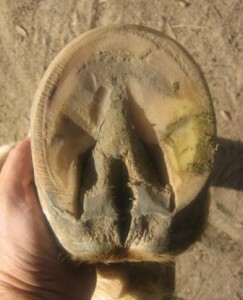 If he’d been on a normal footing they might have stayed good longer… I don’t know. 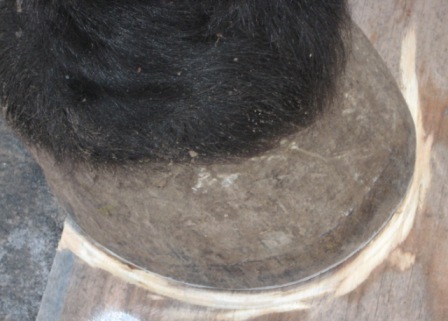 Alfalfa often results in a more brittle wall and poor wall attachment. 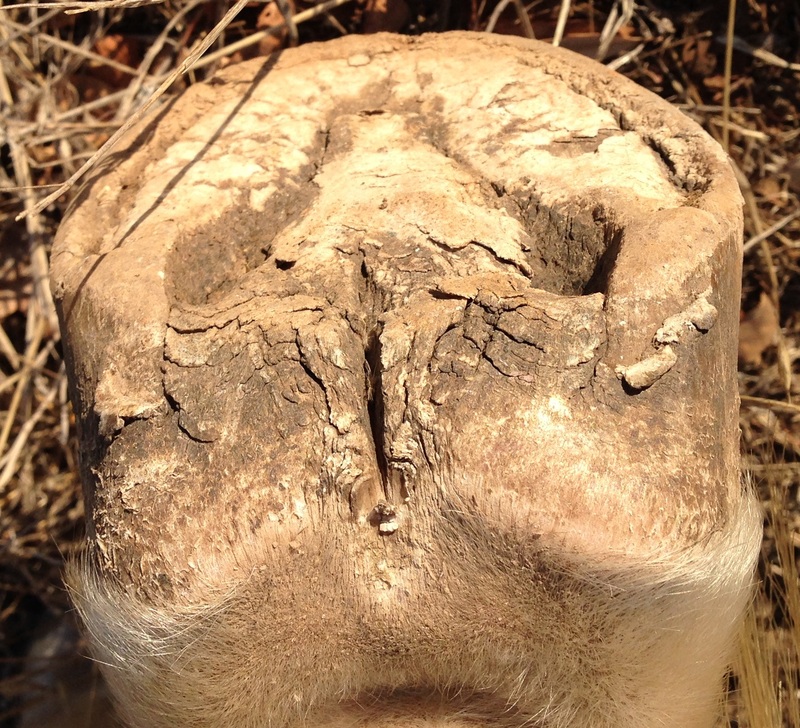 I see this on most horses… the feet almost always get better when alfalfa is removed. Many horses grow a soft wall on oat or grain hay. I don’t know why! Its anecdotal. I was skeptical about how much the small amount of alfalfa in the Elk Grove Stable Mix could affect the feet, but have one client who exchanged Elk Grove for straight grass hay pellets and the difference in the amount of wall separation by the next trim was significant. Its anecdotal, but its something you can try. Too short a wall trim eliminates traction so the sole is subject to more abrasion. 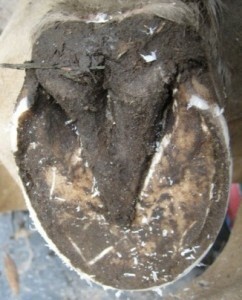 Temporarily letting the heel get a bit taller helps relieve sole abrasion. Let the sole grow and you can lower the heel later. Using boots 24×7 for a week to 2 or 3 months (with pads and Gold Bond) protects the sole and allows it to accumulate. 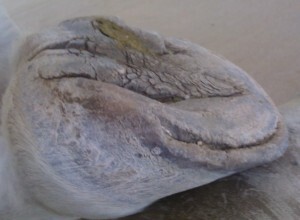 Once the walls are solid and sole has developed, feet usually stay nice unless the environment is extremely abrasive. 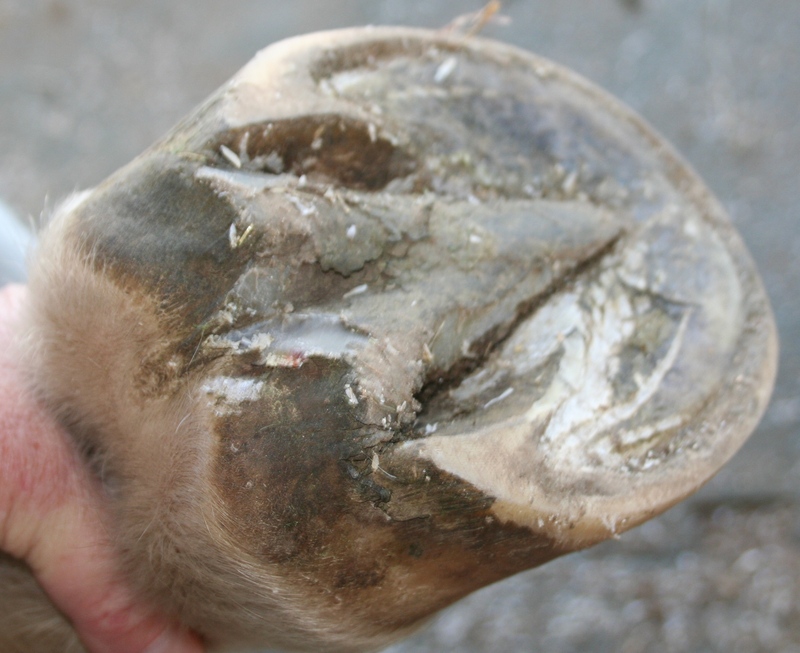 Thin soles make feet tender and can result in mild inflammation, which appears to cause poor wall attachment and wall flare… vicious cycle! Wall attachment is better when feet are comfortable. I trimmed a horse yesterday (large WB type, 1200 lbs) that I have been trimming for 5 months. The prior trimmer was trimming her extremely short, and I expected her to have nice feet in 6 weeks, so I was puzzled. The owner swore she was on straight grass hay diet. Everything else in the diet was perfect,but the mare had persistent stretched white line and I felt she was getting alfalfa! Trusted the owner but… gut feeling…. 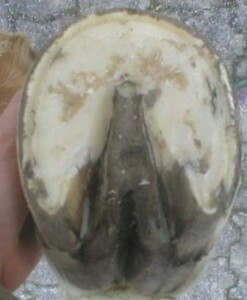 the wall was smashed flat at the base, and the sole was thin and flat. I’m impatient. I was wondering if mild solar inflammation was causing the wall separation. This is a huge mare! So last trim, we were talking about putting on glue-ons (size 5!!) on her to get her wall to grow out a bit and decided to hold off, decided to try deep saw dust in the paddock and boots for all exercise. And if that didn’t work, try boots and pads 24×7 to see if it changed anything. So 4 weeks ago, the owner discovered that the feeders had been feeding her alfalfa as a treat! 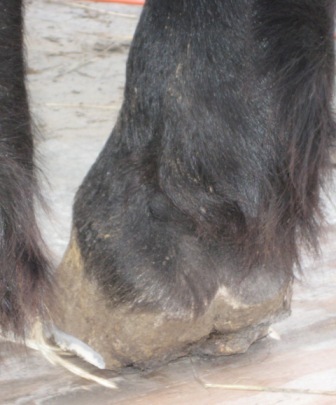 She’s a big mare – maybe they felt sorry for her!! 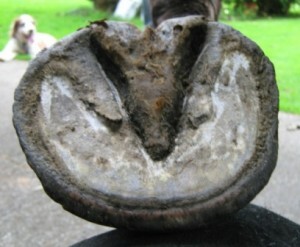 She stopped that, and this trim, she had ¼” of straight wall, no flair, and GREAT soles!!! 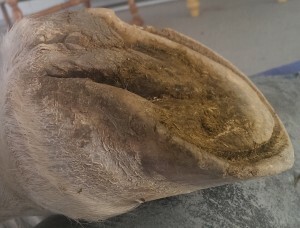 He had chronic laminitis with severe coffin bone degeneration, along with many musculo-skeletal problems, stifle and joint problems. 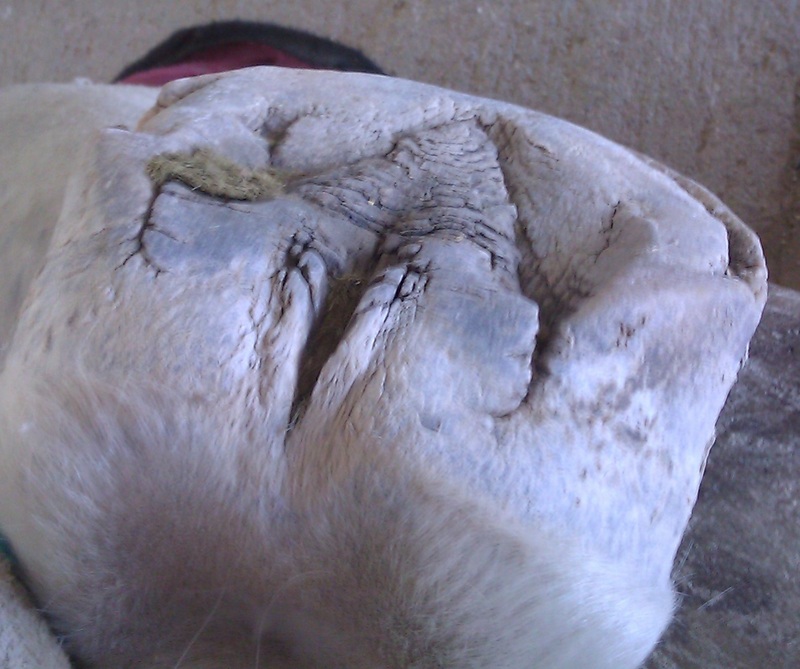 The only reason he lived as long as he did in this state was 1) his pervasive will to live, and 2) he had excellent support from his boarding stable owner and the other horse owners at the boarding facility (who pitched in to help when needed). His owner had financial constraints. so body-workers, trimmers and the boarding facility owner, Michelle of Harvest Moon Ranch, http://harvestmoonranch.net/, volunteered to help when we could. There are several approaches to using an angle grinder to trim. 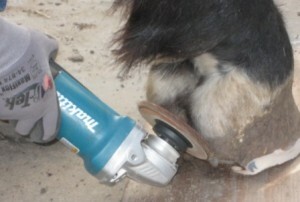 There is a lot of information online to help you choose tools; search for ” grinder hoof trim” and be prepared to read! I suggest that anyone wanting to try this do their research and practice technique ahead of time with wood, plastic and rubber to understand how the different materials affect your ability to hang on to the grinder. 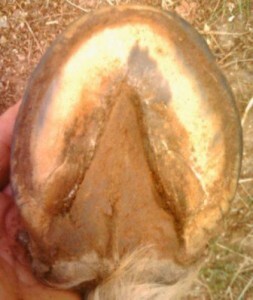 Grinders throw off a sharp blast of air, and this is the one characteristic that has the potential to alarm horses. I stand 4 feet from the horse and have the horse on a long loose lead. I turn the grinder on and off several times, letting the horse watch and get used to the noise, but not showing it to the horse or making a big deal of it. I then turn the grinder on and “fan” my face with the air, making happy “ahhh!’ types of noise. I then do this to the owner and anyone else standing by….. I blow their hair around and laugh. Sounds silly, but it works. 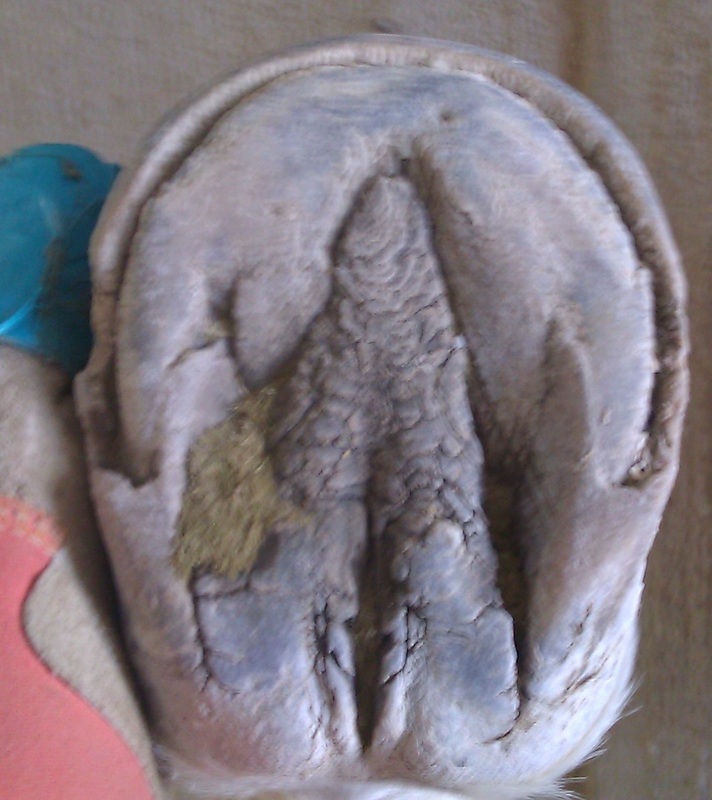 I stand back, turn the grinder on, I fan my face, the owners face, and the the horses face, and, from a few feet away, fan the horses body and legs. 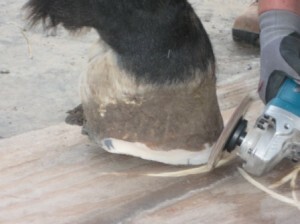 I don’t restrain the horse forcefully, my goal is to engage the horse so that they trust me and the grinder. 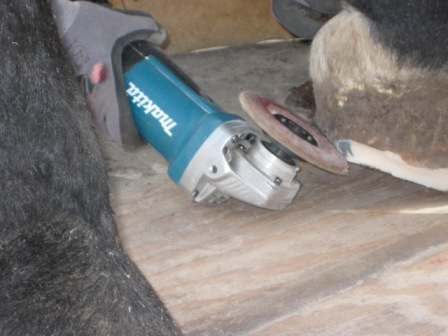 TOOLS – I use a heavy duty Makita angle grinder with a paddle switch. 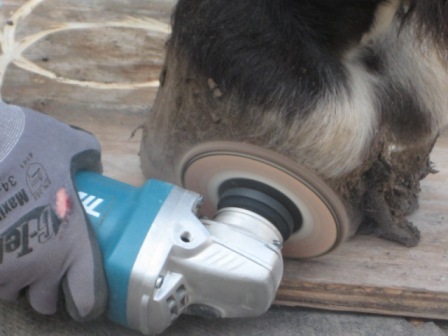 My preferred disc is a 40 or 24 grit flap disc, but I have used an abrasive stone disc also. 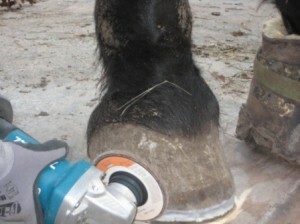 There is a lot of information online to help you choose tools.. search for ” grinder hoof trim” and be prepared to read! ENVIRONMENT – I stand horses on a piece of plywood to trim. The grinder flap disc has to go to the ground to get a clean edge on the bevel, and most other surfaces create problems or present hazards. 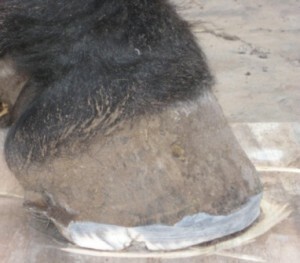 Rubber mats catch the edge of the flap disc and can jerk it out of your hand, metal makes a loud noise when the disc is pressed against it, dirt and sand get thrown up and can get in your eyes or spook the horse. 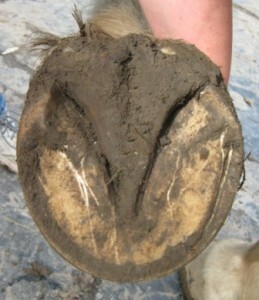 Concrete or asphalt can be used, but a pattern of the horses foot will be left on the surface. HORSE HANDLING – I also like to work in an open area so the the horse can move away from me if it startles or spooks. I ask the handler to stay alert and stay by me, on the same side of the horse that I’m on. If the horse is the least bit active, I have any observers stand on my side of the horse, behind me and at least 3 feet away. 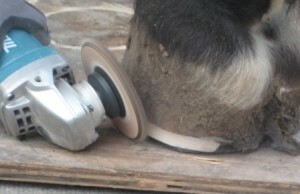 TRIM OBJECTIVE – The objective is to use the edge of the flap disc to etch a bevel around the edge of the hoof from the lateral (outside) heel wall to the medial (inside) heel wall. 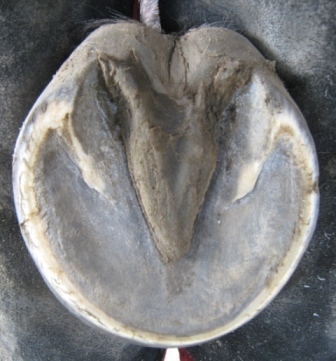 Depending on the angle of the hoof wall and the wall thickness, the bevel will be from 1/4 to 1/2 inc high. 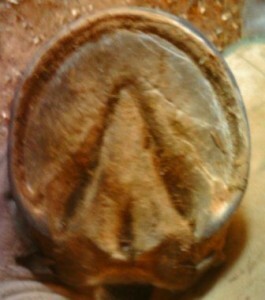 The angle of the bevel is roughly perpendicular to the ground. The top edge of this bevel should parallel the coronet band or growth ring around the front half of the hoof. 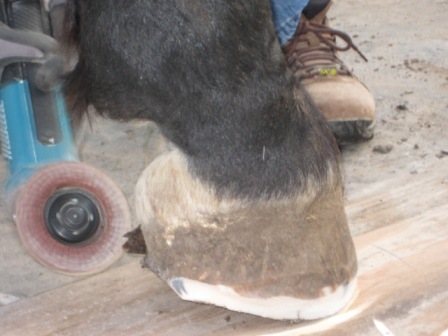 If the horse has high heels and is able to life his heel, I get the horses foot at edge of the plywood so the the heels are hanging off the edge, and try to bevel the heels down with the grinder… this sometimes works ok, sometimes doesn’t work at all! Each case is different. 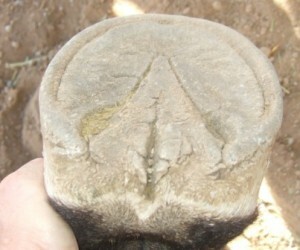 When the training and desensitization goes well, I run through a mental check list, then have the horse holder stand on the same side of the horse as I am on, and I turn the grinder on and, working on a front foot, I lightly touch it to the lower edge of the wall, where the bevel will be. 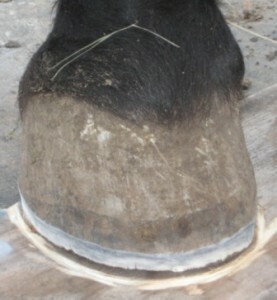 By this time the horse is usually alert but relaxed, and I can continue around the front feet, and then the back.